Hey XR, don’t forget about education! The more years that I teach, I continue to see that learning is a deeply personal endeavor. Whether it is through my own pursuits of learning or student’s acquisition of new skills and content in my classroom, it is clear that rarely do two people find success in exactly the same way. To address this there has been a myriad of pedagogical approaches aimed at trying to address the individual student. Whether it is personalized, individualized, or differentiated learning; the goal is to provide students a learning experience that deeply resonates with them as a person and empowers them to always put forth their best. This year I was so lucky to be able to take 16 of my students to the SXSW Festival in order to explore how XR (AR/VR/MR) can be utilized in overcoming current and future challenges. While each of the sessions provided a valuable perspective on different applications, one quotation stuck with me and became more and more relevant with each additional session. Never before had I really lumped all types of media consumption types into one very accurate grouping. When I continued to examine this seeming unconnected group, one unifying element connected them… 2 dimensions. Thinking back to the “learning from rectangles” quote above, the primarily consumptive (and non-interactive) role the user assumes does not provide the customized relationship that is essential for focused and productive feedback and mentorship that will lead a student to learn. For the purposes of clarification, everything that goes on in a classroom is not learning. There is a lot of teaching, which is categorically different than learning. A teacher can teach for a full class, with students learning nothing. To me (and thankfully a growing number of teachers), the learning in a classroom comes from the “doing” by the student. This means that the student is verifying what was “taught” through experimentation and research OR applying the information to see how it is relevant and applicable. XR has the potential to provide a more robust learning experience for the student by augmenting or supplementing the “doing” in the classroom based on each student’s needs. When students are engaged in a procedure for the first time, a typical structure is to have written instructions (regardless of the complexity of the task) that the student follows. While it is practical to expect students to be able to read and follow instructions, there are some skills where the written steps are convoluted and do not effectively articulate the best way to complete the task. With the support of XR, students would be able to see arrows or lines or connect piece A to piece B visualizations overlayed on the items with which they are actually interacting. Think about the last time you put together a piece of Ikea furniture. This experience would be akin to having the XR device (most likley a headset) identify the name of different pieces as you scanned over them, so that you knew you were using the right piece. In addition, you would see an arrow pointing to the right place to put the piece and could even have a video tutorial overlayed on your environment to demonstrate how the piece should be properly installed. This is not intended to take away from the learning opportunity that comes from failure, but when trying to execute a complex task for the first time, a trial and error scenario often leads to confusion and frustration, not learning and empowerment. From a typical classroom instructional standpoint, this is the same concept as demonstrating a process, but using XR could allow each of the students to engage in that directed step by step experience on their own and reference support when they need it. The difference between the XR experience and a video tutorial is the direct overlay of essential information into the real environment in which the student is seeking to function. This reduces the need for conceptualizing information from the video and then transferring how the skill could be applied in the current, real experience. With students seeking to execute a new skill for the first time, eliminating the barrier of entry for executing the task for the first time sets students up for success. In addition, it is typical for students to take multiple attempts to master a skill. Using the XR device as a support tool, it would be possible to remove the automatic display of certain support elements for students to attempt the task without guidance but would allow those support tools to be brought back in when help was required or requested by the student. In the product development field, XR professionals suggest iterating as quickly as possible as valuable feedback from users helps products to improve more quickly. In a previous post, I talked about instructional pedagogy entitled “Teachers, the World is Changing, Your Instruction Must Change With It”, a core element was that faster feedback is a necessary element of modern classrooms. This principle is cut from the same cloth and focuses on providing a stakeholder (user or creator) with information at a faster rate. XR technologies like the Hololens created by Microsoft utilize augmentation to the real environment in order to provide more details or instructions about what you see and immediate feedback when the environment changes due to an action by the user. Lockheed Martin is using the Hololens as a means for optimizing the training of new employees to help streamline the process of skill acquisition. Tutorials and visual instructions are overlayed onto real products, in the real workspace, and in real time. While only a few, the educational opportunities listed above would be positively impacted by either the augmented nature of the information or data collection (Engineering and Chemistry) or the rapid speed of feedback and access to tutorial assistance (English and Anatomy). Through the application of the XR device, students would receive more specific and timely feedback on the skills they are seeking to master. Realistically, this is hyper-feedback, which allows for faster iteration and more effective learning. 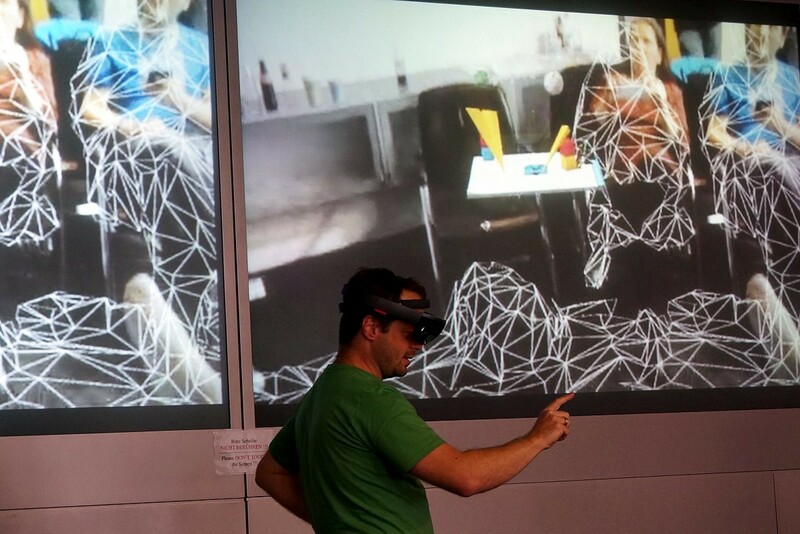 Circling back to the main idea of this post, the experience of learning in 3D with XR is a much more rich and authentic experience that supports students in providing real-time support and feedback on skills that the students are actually doing at that very moment. The traditional 2D consumption focused content requires students to view and then apply where the 3D experience can combine those elements in real time. Sure it is true that 2D, rectangular learning is something that has fostered a plethora of learning in students across the globe. However, I would be remiss as an educator to no consider how modern technology can enhance the learning experiences of my students. All that I am asking is that the XR community remember that content creation can be more than just entertainment. The opportunity for XR integration into learning is a high percentage match in that the idea behind the technology is something that can help facilitate everything we want for our students, a productive learning experience. My name is Andrew Julian and I am a teacher of science, computer science, and technology. I have a passion for considering how technology can positively impact a classroom and the education of all students. Check out my website at andrewjohnjulian.com for more information. The Teachers on Fire Magazine features articles written by agents of growth and transformative change in K-12 education today. If you like to write about education, reach out to @TeachersOnFire to become a writer for this publication. Writers keep full ownership of content.